Clemens F. Kusch - born in Rome in 1963, he took a Degree in Architecture in 1989 and obtained the Research Doctorate in 1993 at the University IUAV of Venice, where he performs didactic activities as visiting professor. In 1995 he founded cfk architetti. The office practises in the sectors of urban planning and architectural design as well as project-management in cooperation with German architecture offices. He works with different magazines and edited edited articles on Spanish, Italian and Portuguese architectures for the DBZ Deutsche Bauzeitschrift magazine. Moreover he published many projects and critical surveys on contemporary architecture in Italian and German books and magazines. He is author of the books “Poli fieristici”, Forma Edizioni (2013) and “Guida all’architettura. Venezia. Realizzaioni e progetti dal 1950”, DOM publishers (2014). 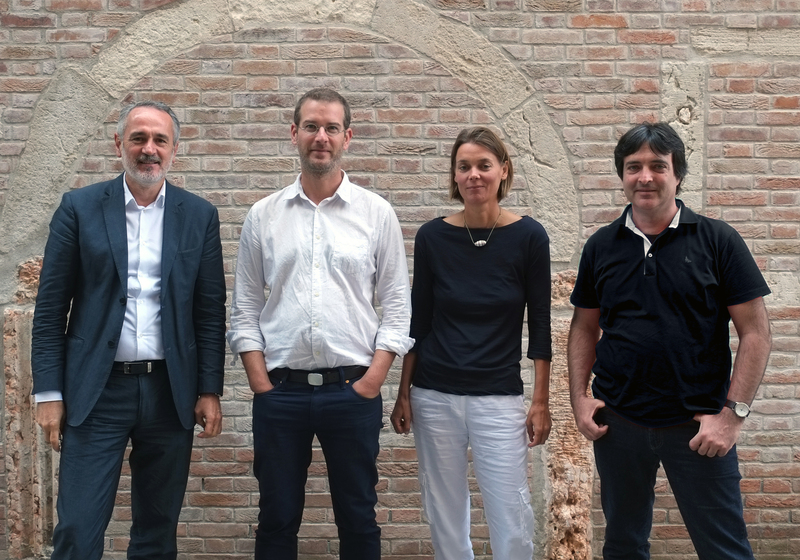 Since 1997 he has been collaborating, as general coordinator for Italy, with gmp von Gerkan, Marg & Partner architecture studio of Hamburg. As a result of this collaboration, the following projects have been developed: the New Trade Fair District of Rimini, the New Air Terminal for Ancona Airport, the hospital “Borgotrento” in Verona, congress centre Rimini and a number of projects for architecture competitions as those for the New Railway Station of Florence and the New Trade Fair District of Milan. From 2009 to 2015 he coordinated the German-Italian joint project for the reconstruction of the Berliner Schloss. Martin Weigert – born in Regensburg in 1974, he took a Degree in Architecture at the Bauhaus University in Weimar, during a student exchange in 2002/03 he completed successfully the Portuguese Degree. Besides three years of formation as a joiner he worked in different architecture offices. Sine 2006 he works for cfk architetti, where he followed amongst others the site of the hospital “Borgotrento”. Anabel Gelhaar – born in Hamburg in 1970, she studied architecture at the University IUAV of Venice. Immediately upon receiving her university degree she went to Hong Kong where, among others, she works in the office if Anthony Ng . In Venice she works for several years for IUAV Studi&Progetti. Since 2007 she has worked for cfk architetti, where she has concentrated on competitions and editorial work. She is author of the book “Guida all’architettura. Venezia. Realizzazioni e progetti dal 1950”, DOM publishers (2014). Andrea Giovanni Zigon – born in Esslingen a. N. in 1967, he took a Degree in Architecture in 2005 at the University IUAV of Venice. Since then he works as an architect in Venice. Since 2009 he works for cfk architetti where he follows different projects.